Scientists in Copenhagen found that exercising for 30 minutes a day over a 3 month period resulted in a greater weight loss than exercising for 60 minutes a day. * Our boxing workouts are all approximately 30 minutes in length and work in line with these findings. 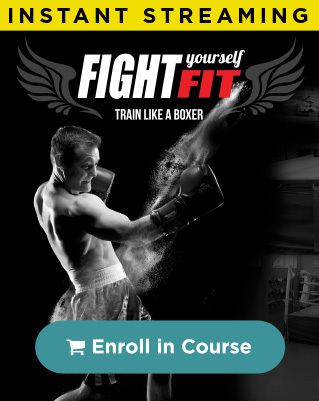 The extra bonus of our boxing training workouts is that you will also learn to box. You can learn real boxing skills, burn maximum calories, reduce your fat mass and lose weight – all in just 30 minutes a day! Not only will you benefit from many physiological advantages, but you also have the opportunity to get your mind engaged and focused, improving your cognitive skills and reducing your stress levels. *(The study ‘Body fat loss and compensatory mechanisms in response to different doses of aerobic exercise – a randomized trial in overweight sedentary males’ is published in the American Journal of Physiology, August 2012). 61 healthy Danish men aged 20-40 took part in a 13 week exercise programme. They were all moderately overweight, leading a sedentary lifestyle, and they weren’t dieting. They were divided into three groups, the first of which was a control group with no exercise prescribed. The second group were prescribed a moderate dose of exercise consisting of a 30 minute daily workout (burning 300 calories). The third group were prescribed 60 mins of daily exercise (using 600 calories). All subjects wore heart rate monitors during their sessions to record the number and length of their workouts, their HR and calculate the energy they used (calories burned). They were encouraged to complete their sessions by being asked to report their workouts regularly throughout the study. The researchers were interested in the relationship between increasing exercise duration and subsequent weight loss. They suggested that negative energy balances (when we use more calories than we eat) trigger ‘compensatory mechanisms’ like increased hunger and reduced metabolism, and that these mechanisms act against the goal of weight loss. 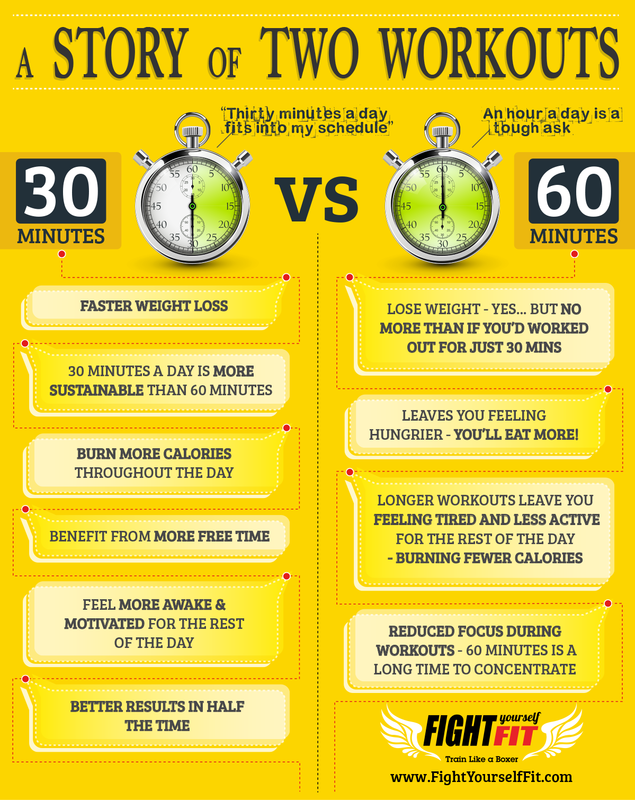 In this study those exercising for just 30 minutes a day lost more weight – 3.6kg compared to 2.7kg. They also lost more fat mass – 4kg compared to 3.8kg. Most positive was the fact that exercise generated weight loss for both groups of people, with an average of 13.5% body fat lost overall. But crucially these great results were achieved regardless of whether the subjects did 30 or 60 mins of exercise. This is hugely significant for those of us who want to get fit, lose weight and are time limited. So how did this happen? The measurements taken during the study revealed some interesting points. For example, the energy balance calculations for both groups were similar. But they shouldn’t have been. Remember – the 60 min group should have used up twice the amount of calories during their workouts. These measurements were similar because something strange had happened. The calculations for the 30 minute group were 83% more negative than expected (they had somehow used up much more energy than they should have) The calculations for the 60 minute group revealed a 20% less negative energy balance (they had used up much less energy than the scientists had expected). So to recap, in this study the 30 min group used up more energy than could be attributed to their prescribed exercise dose. In trying to explain this finding, the researchers suggested that engaging in a moderate amount of exercise might actually lead people to increase their non-exercise related activity somehow, making them more active over the entire day. They also noted that this group didn’t seem to have eaten more to compensate for this higher energy usage and they referred to this the ‘bonus effect’ of moderate exercise. In contrast, the 60 minute exercise group had used up less energy than expected. So how did this happen? As stated above – throughout the study the subjects were required to report their routines regularly. So the researchers knew the workouts were taking place as planned and they had the data from the monitors worn during these workouts, so they knew the energy was being used up in the daily workouts. So how can the results be explained? 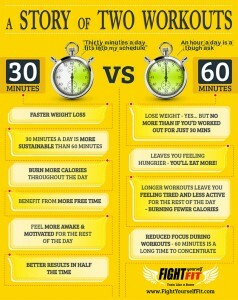 Surely working out for double the time would double the calories burned, and subsequently double the weight loss? It’s not rocket science. It’s a simple input/output equation isn’t it? The researchers in this case suggested that the people in the 60 min group may have eaten slightly more food in response to feeling hungrier after their longer workouts. This might explain the lower than expected weight loss found in the hour workout group, but it isn’t the whole story. It seems that the human body does have a number of protective mechanisms that are triggered when the body is using more calories than it is ingesting. These compensatory factors could include a reduction in resting energy expenditure, a decrease in non-exercise thermogenesis (the energy we use up during other activities that aren’t specifically exercise activities), along with an increase in the actual efficiency of any physical activity. There may also be changes in the regulation of appetite following longer workouts. 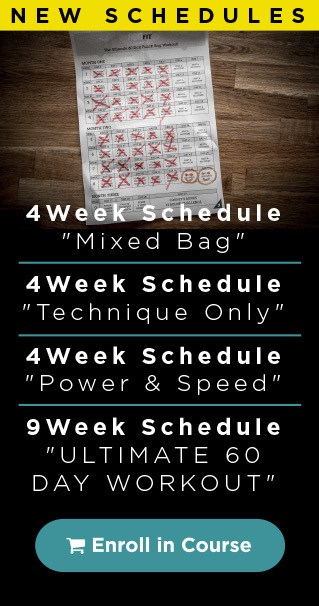 TABATA – High Intensity Interval Training – More pain – less time?! If you’ve learnt something or think Sneak Punch or Fight Yourself Fit could help someone you know – Share it!